Why this is usefull ? 1. for home automation : shutter, classic light (no wifi light like Hue), awning, heating..
2. to control an amplifier or projector by http request, this is usefull when aim the IR receiver is not easy. Why not use IFTTT ? Of course we can do that with IFTTT (maybe, according to your integration of IFTTT), but this is less reliable and less fast. 1. So if I understand correctly, you want a device in which you can add buttons and associate each button to a specific http request. And the request must be called when we click on the button. So it’s really like IFTTT webhooks. 2. And in the same device or in another device, a dimmer associated to a specific http request with parameter that must be changed when the value of the dimmer change and then called. This matches with your request ? Exactly. This would be awesome. "So it's really like IFTTT webhooks" --> Almost. In my case a HTTP request wouldn't go out to the internet but stay on my local network, which I'd prefer over IFTTT. Yes exactly ! And yes this is really like IFTTT webhooks, but much reliable since this doesnt go out of the house and work even if internet is broken. I know that nowadays internet connections are reliable and permanent. 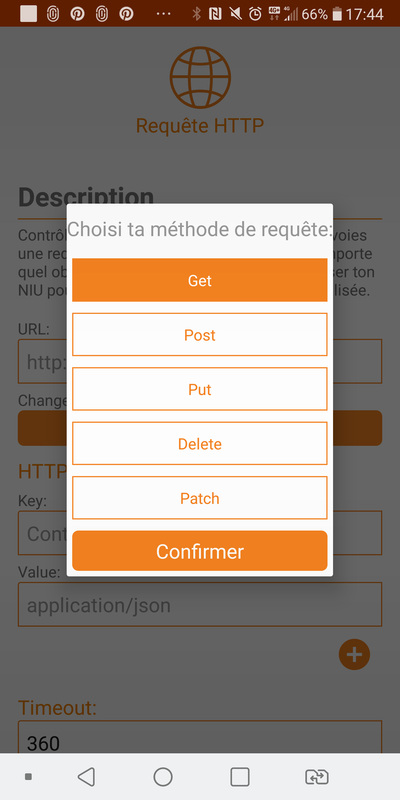 And I already use IFTTT webhooks in a home automation framework. But that said people do not necessarily accept not being able to open a shutter because the internet connection is cut. With HTTP requests I could control almost anything I have at home. This is a really important and basic feature, maybe the most important one for me. 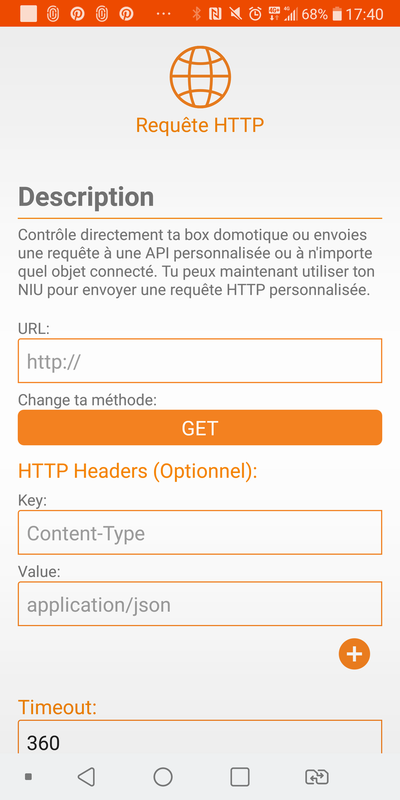 Http request would open the remote to our local http api. The nodon niu button have this option, it could be someting like this. Maybe like the MQTT DASH app on Android. morreale Manuel Nauert Florian Stoffel Joakim Ramer thanks a lot for sharing all these details, it helps us study this feature to better how we could implement it. We'll get back to you as soon as we have news on this. paul luna Definitely, we will try to make it a priority for future updates. HTTP Request YES! But also HTTPS with the option to ignore certificate errors. Roman Ueberück thanks for sharing, just added it to the scope and made sure to share it with our technical team!